Almost one in three NHS trusts in England is now forecasting they will end the financial year overspent, official figures show. More organisations are now in difficulty, compared with the same point last year. Budget pressures may partly be due to hospitals hiring more nurses. 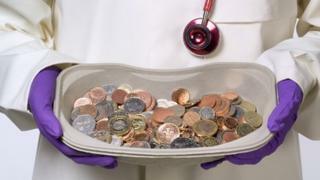 But the Department of Health says hard decisions on public finances have meant it has increased the overall NHS budget. The financial outlook appears to be deteriorating across all types of NHS organisations providing care in England. There are 102 NHS organisations, mainly hospitals, which have their finances overseen by a new body called the Trust Development Authority. Recent board papers from the TDA show 33 expect to be overspent by the end of March. This suggests a number may struggle to demonstrate the standards of financial governance needed to become more independent foundation trusts. Among the 147 existing foundation trusts, 38 are already known to be expecting overspends, with those figures due to be updated soon by their regulator Monitor. Some of the increased financial pressure may be due to an increase in the number of nurses employed. In the year up to October 2013 an additional 2,390 nurses were taken on by trusts in England. Prof John Appleby, chief economist of the Kings Fund health think-tank, said there was every indication that senior managers were putting the standard of care first. "We've had terrible incidents like Mid Staffs. We've had a number of reports produced by the NHS, and independently, suggesting that the NHS really needs to get a grips of its quality of care and services. "And you can see boards making that choice - between perhaps overspending, but maintaining quality." A recent Kings Fund survey of finance directors suggested a growing number were gloomy about the financial prospects, although it was only a small sample who replied. At the beginning of the financial year 20% of all types of trusts in England were expecting a deficit, but that has now risen to 29%. Nick Samuels, the Foundation Trust Network spokesman said " All the evidence we have is that our members are finding it increasingly difficult financially, and the situation is getting worse quickly. "All NHS trusts have been asked to review their staffing ratios as a result of the response to the Francis report into Mid Staffs. "We know a very large number of trusts have had to increase number of staff increasing costs. "For a hospital, between 60-70% of their costs are pay, and that's higher for community and mental health trusts." Between now and the end of the year the forecast position could either improve, or deteriorate further. NHS England holds a £60m fund which can be used for one-off help to financially troubled non-foundation trusts this year. It is small in comparison to the net predicted deficit of £250m, but may be enough to lift those with the smallest financial problems out of deficit. Andy Burnham, the shadow health secretary, said the NHS was facing a "growing financial crisis" because focus had switched to reorganisation. And he warned: "As financial panic spreads, patients will be denied treatments and wards will cut back on staff." But the Department of Health said the government had taken difficult financial decisions, allowing it to give small real terms increases to the health service. A spokesman added: "Most trusts are in a healthy financial position while the NHS sees more patients and carries out more operations than ever." He said productivity had improved for two years running, for the first time in a decade. Are hospitals fiddling the waiting times?